To enhance sustainable development research and practice the values of the researchers, project managers and participants must first be made explicit. Values in Sustainable Development introduces and compares worldviews and values from multiple countries and perspectives, providing a survey of empirical methods available to study environmental values as affected by sustainable development. The first part is methodological, looking at what values are, why they are important, and how to include values in sustainable development. The second part looks at how values differ across social contexts, religions and viewpoints demonstrating how various individuals may value nature from a variety of cultural, social, and religious points of view. The third and final part presents case studies ordered by scale from the individual and community levels through to the national, regional and international levels. These examples show how values can motivate, be incorporated into and be an integral part of the success of a project. 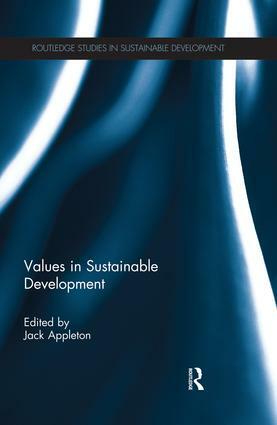 This thought-provoking book gives researchers, students and practitioners in sustainable development a wealth of approaches to include values in their research. Sustainable perspectivalism: who sustains whom?